Whether or not you live in the Northeast, you can appreciate and enjoy this beautiful book. It's full of pertinent and very interesting information that novices as well as the experienced can enjoy. 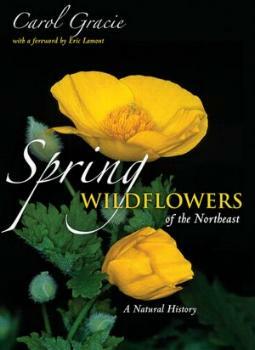 Author/photographer/botanist Carol Gracie combines historical elements of botany like the Doctrine of Signatures and the observations of Henry David Thoreau with cutting-edge, modern research to present a comprehensive story of the natural history of each species covered! And there are more than thirty species in this book. The binomial naming system is incompehensible to me, a non-botantist, non-academic-type, but I didn't let that detract from my love of flowers, nature, and bugs. The beauty of this book was that I'd never heard of many of the featured plants, and to be introduced to them visually as well as informatively, was a pleasure. The book begins alphabetically with Baneberries (Buttercup Family), then Bloodroot (Poppy Family), and so on. Habitat and range for each plant is also supplied in case you're interested in seeking some of them out. Much of the information is useful and informative when learning about new plants and flowers, and Ms. Gracie has done extensive research which makes her book doubly interesting. Some of my favorite flower photos are Bleeding Hearts (pg 51); Round-lobed Hepatica (pg 92); Spring Beauties (pages 162-171); Painted Trillium (pg 178), and Virginia Bluebells (pg 222). I also liked the photos of the bugs and insects. Exquisitely illustrated. There is an extensive Glossary and Reference section. Conclusion - Just beautiful. Very informative without being too difficult to appreciate.